HOLBROOK, NY--(Marketwired - May 10, 2017) - On May 3, 2017, EVP of American Portfolios Holdings, Inc. (APH) and Chief Legal Counsel Frank A. Tauches Jr., and American Portfolios Financial Services, Inc. (APFS) affiliated financial advisor William Donahue, arranged a ceremony to honor local World War II (WWII) military veteran Vincent Robert Long. Long -- who served in the United States Marine Corps from Aug. 26, 1943, to Feb. 20, 1946, as a Private First Class -- never received his official, military-issued uniform. Together, Tauches and Donahue worked diligently to fill in this missing piece of Long's military history. APFS, a privately-held, independent broker/dealer that services financial advisors across the country, has a long-standing commitment to corporate social responsibility. APFS is also a regular supporter to Honor Flight Long Island, a local chapter of the national Honor Flight Network -- a non-profit organization that provides military veterans with free trips to visit Washington, D.C. memorials. "Being a good citizen -- both private and corporate -- means giving back to the community; that can be done in a multitude of ways," stated APFS CEO Lon T. Dolber. "It's important for people to find a cause that's near and dear to their hearts and to actively seek to make a difference and effect change -- be it by raising funds for a local charity or devoting time to organizations that are in need of a helping hand." As part of this mission, Dolber encourages APFS employees and affiliated colleagues to take part in various forms of community outreach. Donahue, a board member of Honor Flight Long Island and a regular participant in accompanying the military veterans to D.C., met Long on the Fall 2016 Honor Flight trip. It was there Long confided in Donahue that he didn't received his "Greens," a standard practice all new recruits are supposed to be outfitted with when they complete boot camp. Long, who received his basic Marine Corps training at Montford Point Marine Camp in North Carolina -- a military installation established at the time to train African-American recruits solely, ending its segregated status in 1948 with the issuance of an Executive Order from President Harry S. Truman -- went on to fight on the islands of Okinawa and Saipan in Japan during the Pacific Campaign of WWII. The Battle of Saipan (1944) resulted in the U.S. acquiring strategic control of an air base from which to deploy B-29 bombers. Among his many duties, Long served as a stretcher bearer, transporting the wounded and deceased from the battlefield. Determined to honor the wishes of a veteran who served his country so honorably, Donahue reached out to Tauches for assistance. A distinguished military career encompassing 43 years of active and reserve service in the U.S. Marine Corps as a JAG officer and company commander, throughout his career Tauches has had many opportunities to publically recognize U.S. military veterans. Said Tauches, "After Mr. Long served in the Marine Corps, he became a public servant working for the MTA. All this time, he's had, what I'll call, lingering desires about his military service -- about a uniform that he had hoped to wear." When Tauches walked into the Marine Corps Exchange at Henderson Hall in Arlington, Va., and informed the personnel about Long's situation, in a quick turnaround they assembled the uniform per Tauches instructions to make it a Dress Blue Uniform -- the most widely recognizable uniform of the Marine Corps -- instead of "Greens." On Wednesday, May 3, 2017, the wait was over. Journalists from Newsday, as well as a film crew from Cablevision's News 12 Long Island and filmmaker Anthony Giacchino -- whose production company Time Travel Unlimited, LLC, has been documenting Long's story for a cable network special to mark the 75th anniversary of the end of WWII -- descended on Long's Hempstead, N.Y., home to capture the honor ceremony for posterity. Attired in his Dress Blues, Tauches presented Long with his long-awaited, military-issued dress. When asked what it was like to don the uniform, he replied, "It took them 71 years, but we made it. The old boy almost didn't make it." 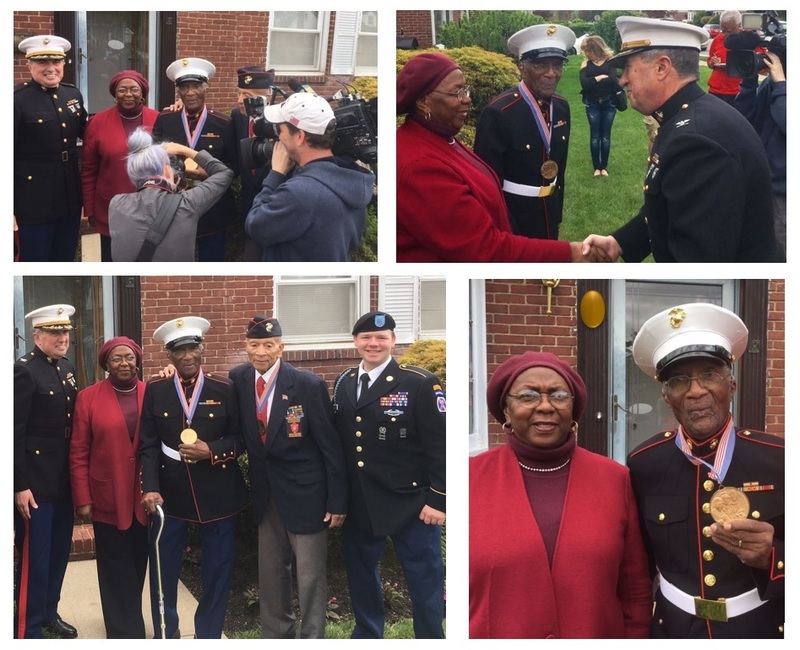 The ceremony extended to the Hempstead Village Hall, where Long -- surrounded by family and friends -- received sincere thanks and a citation for his service to the United States from Mayor James A. Garner. Although his time in the military left him with shocking and painful memories, Long was proud to serve. "He's an inspiration," Donahue declared. "He's the person we all want to be. He endured so much, and yet still has a positive outlook." The News 12 Long Island coverage of the event is available for viewing on LongIsland.News12.com; Newsday will be publishing content within the coming weeks, and Giacchino's VJ-Day special is expected to air in September 2020. Headquartered in Holbrook, N.Y., APFS is a full-service, independent broker/dealer and member firm of FINRA and SIPC, offering a complete range of financial services, including personal financial and retirement planning, securities trading, mutual funds, access to investment research, long-term care planning, insurance products and tax-free investing. Fee-based asset management is offered through its sister subsidiary, American Portfolios Advisors, Inc., (APA), an SEC Registered Investment Advisor. Both entities, along with technology entity American Portfolios Advisory Solutions, LLC, collectively reside under the legal entity American Portfolios Holdings, Inc. (APH). Full-service securities brokerage is available through a clearing firm relationship with Pershing, LLC, a BNY Mellon firm, the securities of which are held on a fully disclosed basis. The company currently serves 801 independent investment professionals located in 365 branch locations throughout the nation. It was named Broker-Dealer of the Year* (Division III) by Investment Advisor magazine in 2015 and 2016. Additionally, it was recognized as the No. 1 Best Small/Mid-Size Company to Work for in the state of New York for 2016, and again placed in the Top Five Best Companies for 2017, by the New York State Society for Human Resources Management (NYS-SHRM) and the Best Companies Group (BCG). More About APFS CEO Lon T. Dolber: Among his many charitable activities, Dolber serves as the vice chairman of World T.E.A.M. Sports (WTS), a national non-profit organization that facilitates outdoor sporting challenges among disabled and able-bodied athletes -- many of whom are military veterans. More About APH EVP Chief Legal Counsel Frank A. Tauches Jr.: While acting as the president of what is now the Marine Corps Reserve Association, Tauches had the opportunity to address the U.S. Senate Armed Services Committee regarding the reduction of the Marine Corps Reserves during the era that followed Operation Desert Storm. He currently serves on the Marine Corps Community Services Oversight Committee, which meets regularly at the Pentagon. In addition to his military career, Tauches also served as mayor and trustee of Garden City, N.Y.
More About APFS Affiliated Advisor William Donahue: Donahue is the producer of Unspoken, Now Told: Soldier Stories, a short film based on the Silent Strength video series -- produced by APFS' in-house media production facility, Studio 454 -- which features the first-person accounts of local WWII veterans and Honor Flight recipients. Vincent Long finally receives his military-issued Dress Blue uniform 71 years after his service in the Marine Corps during World War II; the uniform was presented by American Portfolios Financial Services EVP and Chief Legal Counsel Frank A. Tauches Jr., who has a distinguished military career spanning 43 years.